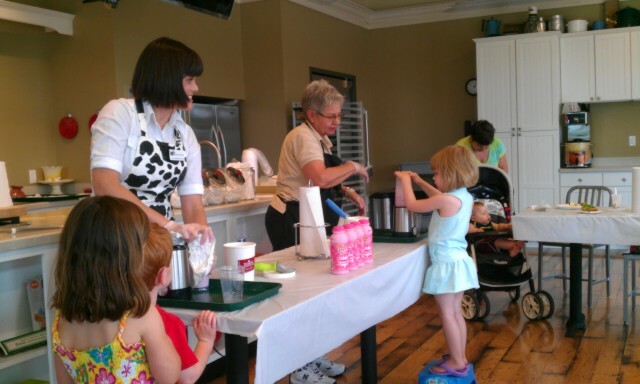 Farm to Table Field Trips Part 1- Happy Dairy Month! but I was eagerly anticipating the actual cooking class with my girls. In approximately 90 minutes, the girls completed four nutritious and aesthetically pleasing snacks: Tuna Cheese Sailboat Sandwiches, Ring around the Rainbow Parfait, Vegetable and Cheese Kabobs, and Strawberry Milk Blender Special. 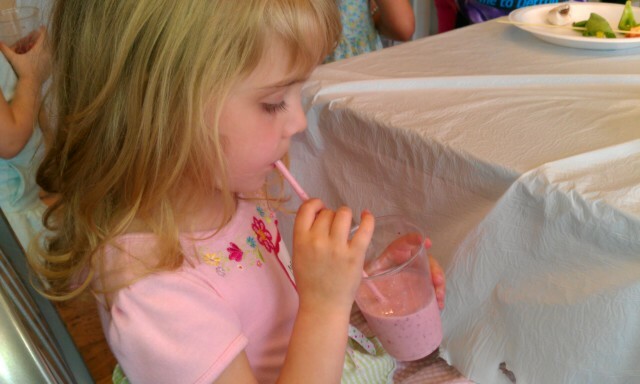 Besides the focus in each of the recipes as having dairy as a main ingredient, the farm to table ideal was also brought forth with fruit for the parfaits and smoothies being freshly picked that day. Being introduced to the baker who baked the rolls bright and early from the adjacent kitchen for our sandwiches allowed us to literally visualize where our food originated or was authored. Thus, if an ingredient was not produced from farm to table by Eckert’s, local products were implemented for use in the recipes. The girls worked at their own stations with much intensity and determination. My three-year-old sawed diligently through tomatoes with her plastic knife while my (picky-eater) five-year-old ate every last bite of the cantaloupe parfait she had created. Although neither squirt dived into the tuna sandwiches (convinced they do not like tuna, but don’t realize I hide it in the marinara sauce), their pride with their handiwork was evident when they demanded we take the sailboat-shaped sandwiches home for Daddy to enjoy.